One of my favorite things about the recent Rainbow Six games was Terrorist Hunt in R6: Vegas 2. Just one simple objective, kill the bad guys. You could approach the situation however you saw fit; go in quiet, find an entrance from above, or just breach the front door. Choice became a strategy which is why I’m happy to see that Rainbow Six Siege going back to basics but in a new, refreshing way. 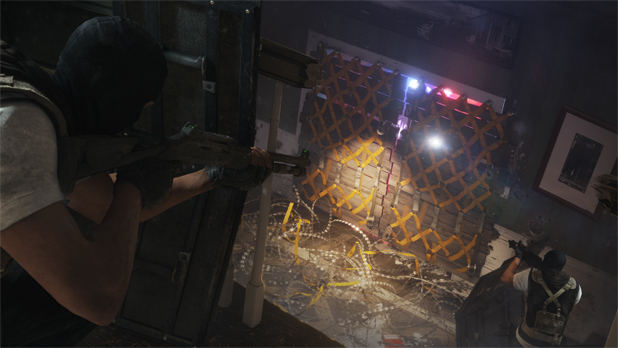 Ubisoft revealed their new tactical multiplayer shooter during their E3 press conference with an impressive demo that featured repelling, breach charges, riot shields, flashbangs…everything you would expect to be in a Rainbow Six title and then more. New procedural destruction element means danger can hide behind any wall, window, and roof; allowing players to forge their own route through the map. The map itself is not some giant battlefield with 60 some odd players, its simply a house in the Boston suburbs. It appears that Siege is going for a more refined shooter; rather than have firefights on a massive scale, it puts the player in a 5 on 5 match that last roughly 5 minutes. Perma-death also ups the intensity and is a staple in the tactical shooter genre. But what I loved most from the demo was the pure team-play (on both sides) flanking, watching each others backs,In a lot of online shooters you are a part of a team but you never really have to play with your team. It’s nice to see a game that appears to require actual teamwork. Each player seems to have a specific role that they can fill, which allows players to complement each other in combat. 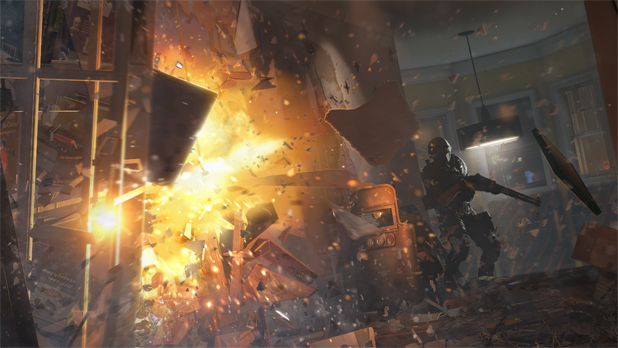 While a lot of shooters have been focusing on massive maps and lots of players, Rainbow Six Siege should be a welcome change of pace whenever it comes out (if it comes out) in 2015.